History- Bothans hail from the industrial Mid Rim planet of Bothawui, though they also populate various colony worlds like Kothlis and Torolis.They developed their technology to travel among the stars millennia ago and are longstanding members of the galactic civilization. 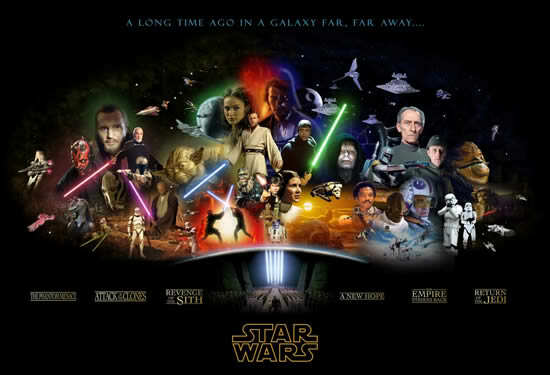 To the Bothans, information is the galaxy's most valuable currency, as well as its most potent weapon. As a culture, they believe the direct confrontation with foes-whether economic, political, or martial-is pointless. In an open conflict, the object or possession both sides desire is often damaged or destroyed. This attitude has made espionage a natural line of work for Bothans. Information and spies are their greatest exports. The famed Bothan spynet is the largest independent intelligence-gathering organization the galaxy has ever known. Beings of power everywhere find Bothans irritating because they have a tendency to use every bit of information they can to acquire leverage or money. However, no one wants to be the only person without access to the spynet, so everyone continues to deal with the Bothans. 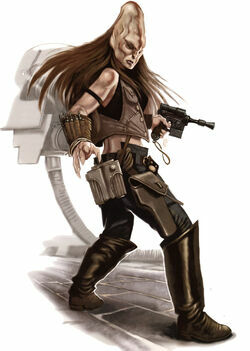 Personality- Bothans are manipulative, crafty, suspicious, and curious by nature. Some might even call them paranoid, although they are also loyal and brave. Physical Description- Bothans are covered with fur that ripples in response to their emotional state. They have tapered ears, and both male and female Bothans sport beards. They average about 1.6 meters tall and have a maturity rate and life span slightly greater than Humans. History - Cereans were a sophisticated and cultured humanoid mammalian species that hailed from the planet Cerea in the Mid Rim. Cerean males aged more quickly than the females, who had similar lifespans to Humans. Thus, there were fewer males than females. Polygamous marriage was a necessity in order for the species to survive. Each male usually had one primary "bond-wife", and between four and ten "honor-wives". Famous for their extraordinary thinking abilities, Cereans were often found among the ranks of the Jedi Knights, despite being exempt from the Jedi's vow of celibacy, due to their low birth rates. Cereans also developed a low-tech society on their homeworld, and preferred to live in isolation from the wider galaxy. Personality - Because of their thoughtful nature, they tended to be calm, rational, and analytical, preferring peaceful philosophies and a lifestyle which worked in harmony with nature. Though the quick-thinking Cereans had equally quick reflexes, they were commonly not as well coordinated as Humans. Physical Appearance - Cerean's averaged at about 2 meters tall, with tall tapering heads. Their enlarged skulls, extending up to twenty centimeters above their foreheads, housed complex binary brains, provided with sufficient blood by an extra heart in their heads. There hair color can range anywhere from red, brown, black, and even bald; but there hair normally changes to white or gray with there age. History - As one of the first cultures to develop hyperdrive spacecraft (some even believe the first), Duros-charted trade routes were among the oldest hyperspace routes still in use during the Imperial era. Even in the later periods of galactic history, Duros were still known for their superior astro-navigational skills. The Duros language was Durese, which was a lingua franca of sorts amongst spacers. Their home planet Duro was primarily uninhabited due to massive pollution on the world over time. Instead, it was covered with automated farms for food production. The Duros lived in twenty orbital space cities above the planet. Personality - While usually taciturn, Duros enjoyed telling stories about their travels. It was said Duros had a photographic memory when it came to the telling of tales and stories. Many Duros were pilots and explorers, and were adventurous, though sometimes rash. Physical Appearance - The Duros were humanoids with smooth skin that aranges anywhere from blue to green, red eyes, lipless mouths, and long thin noseless faces. Olfactory glands beneath their eyes were responsible for their sense of smell. Both females and males were bald, though both genders were easily distinguished. Their large red goggle-like eyes also had slit pupils. The Duros also averaged from about 1.7 to 2.2 meters tall. History - Ewoks were curious individuals that stood about one meter tall; they were omnivorous and used spears, slings, and knives as weapons; they also used hang gliders, battle wagons, and bordoks as vehicles. Although extremely skilled in forest survival and the construction of primitive technology like gliders and catapults, the Ewoks had yet to progress past stone-level technology when discovered by the Empire. They were quick learners, however, when exposed to advanced technology with simple mechanical processes and concepts. Some Ewoks were removed from their planet and taken as pets or slaves. Others left voluntarily out of a sense of curiosity, especially after the Battle of Endor led to the establishment of New Republic trading posts on the Forest Moon. Personality - Ewoks are generally curious, primative beings; but despite being primative Ewoks were when shown and exposed to advanced technology with some simple mechanical workings. 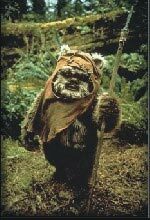 Physical Appearance - Ewoks appear as stocky, sapient bipeds which stand about one meter tall. They have flat faces, are completely covered in fur, and have large jewel-like eyes. Both their fur and their eyes come in a variety of earth-tones, primarily brown, white, grey, gold, and black. Despite their small size, Ewoks are strong. History- Gamorreans are green-skinned, porcine creatures native to Gamorr. Their tendency toward violence makes them valued as criminal enforcers; though viewed as mindless brutes, they don't care so long as they are paid to fight. Gamorrean civilization revolves around the never-ending wars between their clans. Preferring large melee weapons in combat, many see ranged weapons as cowardly. Males live to fight; females farm, hunt, and manufacture weapons. Inter-clan hatred rarely fades, and anyone hiring Gamorreans should be aware of their clans to avoid infighting. Personality- Gamorreans are brutish, violent, and proud. They respect physical prowess and have no problem facing death against a foe they feel they are on at least equal footing with. Physical Description- Gamorreans average about 1.8 meters tall, with thick green skin covering powerful muscles. Close-set eyes, a thick snout, tusks, and small horns give them their distinct appearence. Description- The Gungans are omnivorous humanoids native to the swamps of Naboo. Technology advanced, they rely mostly on biotech, growing instead of building their homes and production facilities. While their culture is peaceful, it evolved from a series of long, bloody clan wars, and Gungans still admire strength and cunning. Most communities are devoted to farming or manufacturing goods that are then traded to other Gungan settlements, but they will reluctantly trade with the Humans of Naboo. Personality- Gungans tend to be inquisitive, cautious, and suspicious. 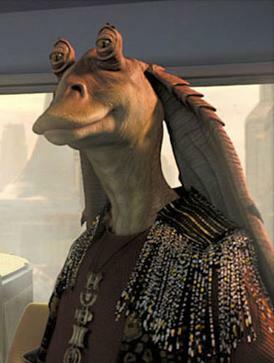 Physical Description- Gungans range from 1.6 to 2 meters tall, with two eyestalks, long floppy ears, and long tongues. Description- Humans dominate the Core Worlds and can be found in virtually every corner of the galaxy. They are the ancestors of early spacefaring pioneers, conquerors, traders, travelers, and refugees. Humans have always been people on the move. As a result, they can be found on almost every inhabited planet. As a species, Humans are physically, culturally, and politically diverse. Hardy or fine, light-skinned or dark, Humans remain one of the most dominant species throughout all eras of play. Personality- Human personality runs the gamut of possibilities, though members of this species tend to be highly adaptable, tenacious, and willing to keep striving no matter the odds. They are flexible and ambitious, diverse in their tastes, morals, customs, and habits. Physical Description- Humans average about 1.8 meters tall. Skin shades run from nearly black to very pale, hair from black to blonde. Men are usually taller and heavier than the women. Humans achieve maturity about the age of 15 and rarely live beyond 100. Description- Ithorians are tall humanoids whose appearance leads many to refer to them colloquially as "Hammerheads." Peaceful and gentle, Ithorians are widely recognized as talented artists, brilliant agricultural engineers, and skilled diplomats. Ithorians are perhaps the greatest ecologists in the galaxy, devoting their technology to preserving the natural beauty of their homeworld's jungles. They live in "herds," dwelling in cities that hover above the surface of their planet and strive to maintain the ecological balance in the "Mother Jungle." Ithorians also travel the galaxy in massive "herd ships," masterpieces of evironmental engineering that carry a perfect replica of their native jungle. Many look forward to trading for the exotic wares the Ithorians bring from distant planets. Personality- Ithorians tend to be calm, peaceful, tranquil, and gentle. Physical Description- Ithorians are humanoid, ranging in height from 1.8 to 2.3 meters tall, with long necks that curl forward and end in dome-shaped heads. They have two mouths, one on each side of their neck, producing a stereo effect when they talk. Description- The Kel Dor evolved on Dorin, a world with an atmosphere consisting mostly of helium and a gas that is unique to that world. As such, Kel Dor cannot breathe on planets with common nitrogen/oxygen atmospheres. Conversely, Dorin's atmosphere is toxic to most nonnative life. On other planets, Kel Dor dwellings provide their native atmosphere which are stored in large tanks. When outside, Kel Dor must wear breath masks and goggles. They can neither see nor breathe without these devices. Most Kel Dor breath masks include vocorders that amplify the wearer's speech; while their vocal cords function normally in their native atmosphere, Kel Dor must shout to produce sound in other environments. Their eyesight, however, is enhanced when they are away from Dorin. Personality- Calm and kind, the Kel Dor never turn away a being in need. Still, most believe in quick, simple justice (even if it means engaging in vigilantism). Physical Description- The average Kel Dor stands between 1.6 and 2 meters tall. Their skin ranges from peach to deep red, and most have black eyes. Description- Amphibious land-dwellers, the Mon Calamari share their Outer Rim homeworld with the aquatic Quarren species. They tend to be soft-spoken but vigorously defend causes that inspire them. Mon Calamari suffered under great oppression under the Galactic Empire; thus, it was one of the first worlds to declare support for the Rebel Alliance. Mon Calamari are widely recognized for their keen analytical and organizational abilities, and they have developed a reputation as being among the foremost ship designers in the galaxy. They see everything they create as a work of art, not just as a tool or a weapon. Personality- Creative, quiet, and inquisitive, the Mon Calamari are dreamers who cherish peace but aren't afraid to fight for the causes they believe in. 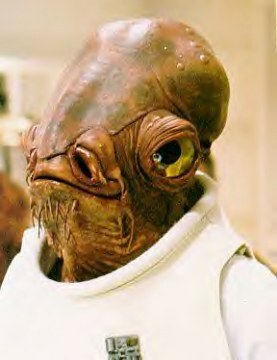 Physiacal Description- The average Mon Calamari stands 1.8 meters tall. They have high-domed heads, large eyes, and smooth, mottled skin. Description- The Quarren hail from the distant Outer Rim world of Mon Calamari, sharing the world with the sentient humanoid species, the Mon Calamari. The Mon Calamari live on the surface of the world, while the more isolationist Quarren dwell in oxygen-filled cities in the deep recesses of the oceans. Offworld, Quarren generally stay clear of galactic politics. Instead, they often become involved with shadowy occupations such as pirates, smugglers, and spy networks. Many Quarren blame both the Empire and the Rebels, (even more than the Mon Calamari), for their homeworld's devastation during the Galactic Civil War. Personality- Practical and conservative, Quarren tend to hate change and distrust anyone who displays overt optimism and idealism. 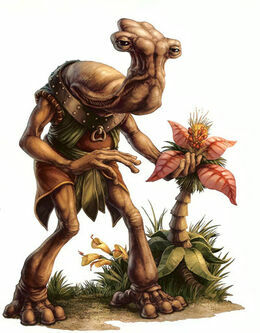 Physical Description- The average Quarren stands 1.8 meters tall. They have leathery skin and heads that resemble four-tentacled squids, hence the name "Squid heads" sometimes used by others. Description- Rodians hail from the Tyrius star system in the Mid Rim, their homeworld is humid and choked with heavy rain forests teeming with dangerous lifeforms. In this hostile environment, the Rodians evolved into brutal hunters and killers in order to survive. As a result, Rodian culture centers around the concept of "the hunt." Their art glorifies violence and the act of stalking prey. The more intelligent and dangerous a hunter's prey, the more honorable the hunt. Rodians have numerous annual festivals that exist solely to honor such activities. Since joining the rest of the galaxy's spacefaring species, the Rodians have come to view bounty hunting as the most honorable profession in existence, and many have found great success in this field. Personality- Rodians tend to be violent, tenacious, and dedicated. Physical Description- Humanoid, with multifaceted eyes, a tapered snout, and deep green skin, the average Rodian stands 1.6 meters tall. History- Twi'Leks were an omnivorous humanoid species originating from the planet Ryloth. They tended to eat cultivated molds, fungi, and rycrit meat. Twi'lek females were often used as slaves or dancers because of their beauty. A Twi'lek's brain-tails were highly sensitive, and grabbing them forcefully was so painful that it could easily incapacitate almost any Twi'lek. Sometimes, damage to the brain tails caused lasting damage to the Twi'lek's brain. The beauty of female Twi'leks was well known throughout the galaxy, and as a result many nubile ones were sold into slavery, becoming dancers or status symbols, most notably by Jabba Desilijic Tiure, while the usual ugliness of the males was also well known. Personality- Most Twi'Lek women are very graceful and have exotic beauty, while on the other hand most Twi'Lek males are strangely ugly. Most Twi'Leks believe that having there females sold into slavery was a great way to get them off of the rugged planet of there homeworld, Ryloth. While many Twi'leks lived their lives as merchants or even criminals, the race also had a proud and honorable warrior tradition. Both sexes were also very seductive. Physical Description- Their distinctive features included colorful skin, which varied in pigment from individual to individual, and a pair of shapely prehensile tentacles that grew from the base of their skulls. The tentacles, called "head-tails," "lekku," or "tchun-tchin," are advanced organs used for communication and cognitive functions. The two most striking features of a Twi'lek were their broad range of skin coloration within the species, and pair of brain-tails. The brain tails protruded down the back of the skull and contained part of a Twi'lek's brain. They also average about 1.6 to 2.4 meters in height. Males had humanoid ears, and among females there is equal biological evidence for humanoid ears and ear "cones". Both males and females lacked body hair, with the only notable exception being eyelashes to aid in keeping out the sand and heat of Ryloth. Females typically had painted eyebrows or had their eyebrows tattooed on, in order to appear more palatable and less alien to more base-line humanoid offworlders. History- The Wookiees, whose name for themselves translated to the People of the Trees, were a species of hairy bipedal humanoids that were inhabitants of the planet Kashyyyk. One of the most noteworthy members of the species was Chewbacca, Han Solo's best friend and co-pilot, who played a vital role in the Galactic Civil War and afterwards. The Wookiees' natural habitat was the dense forests of the planet Kashyyyk (though one source does contend that they were immigrants to this planet). Kashyyyk was covered with massive wroshyr trees, in which the Wookiees constructed their homes and cities. Reportedly, Wookiees were descended from tree-climbing mammals. Personality- They had the ability to easily learn most languages. However, Wookiees lacked the vocal structure to speak anything other than their own languages. Wookiees were often short-tempered. 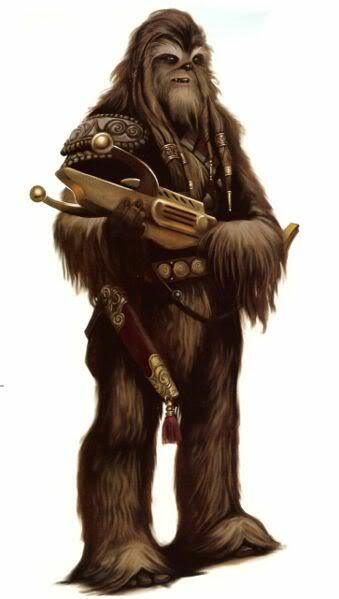 Wookiees possessed a fierce style of fighting, typically eschewing standard blasters and grenades in favor of bladed weapons, such as ryyk blades, as with the Berserkers, and powerful bowcasters—weapons physically weaker species could not use effectively. Physical Description- Adult Wookiees were tall, in excess of two meters in height, and were covered with a uniform, mid-length coat of thick hair in various shades of brown. Although albino Wookiees were rare, they were not unheard of. However, such a birth was generally held to be a bad omen, as white hair did not blend in with the earth-tones of their forest surroundings. History- The Zabrak, also known as Iridonians (when referring to the Zabrak who came from Iridonia), were a humanoid species native to Iridonia, a planet located in the Mid Rim known for its inhospitable terrain and fierce predatory life. As one of the earliest spacefaring species in the galaxy, the Zabrak played a major role in Galactic affairs. Like the early Humans, the Zabrak established many colonies outside their home system early in their history. The Elomin species was believed by some xenoarchaeologists to be descended from Zabrak colonists who settled Elom in the distant past. By the time the Zabrak encountered the Republic, they had a total of eight colonies in five systems. Long ago, the Sith had made contacts with the high council of Iridonia in order to hire the services of their most talented mercenaries. This influence remained with the Zabrak people long after the Sith were thought to be wiped out at the Seventh Battle of Ruusan, though it remained more closely associated with the Zabrak of Iridonia than the Zabrak of their colony worlds. Personality- They were a race known for having a fierce sense of self-determination and an equally dominant need for independence. Zabrak were often seen by most other species as being single-minded, an observation that was not terribly incorrect. This single-minded determination came from the fact that they were a race with a strong sense of self-assuredness, confident that they were able to accomplish any task that they set out to do. Though, they do have the conciededness quality, they do not think of themselves has any better than there subspecie cousins on other planets and colonies, though they were some competetion. Physical Description- Zabrak resembled Humans to some degree, but had a number of significant physical characteristics that set them apart from baseline Humanity. The most striking of these were a series of vestigial horns that crowned the heads of both males and females. They average at 1.8 meters tall and speak the language Zarbraki, have horns and facial and body tattoos. There skin color ranges from Pale to dark brown, red and black, orange and yellow.They also have a wide range of eye colors and have many differences in there inner body functions, that set them apart from there close Human Species.